Widowed mother Emma Barlow knows her shy, studious son needs a male influence. And where better to find him than in the mentoring ministry at their local church? But when the new chief of police becomes her son's mentor, Emma is worried. As the widow of a fallen officer, she's nervous about letting a lawman into their lives. Especially one as handsome -- and conflicted -- as Jake Sutton. 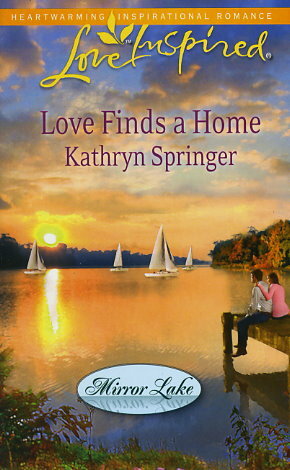 But when her son comes out of his shell, and even Emma finds herself smiling, she knows that love just might find a home in Mirror Lake...and create a new family. This is a sad story about a woman still grieving six years after her police officer husband was killed during a high-speed chase. She is very over-protective of her son and doesn't realize that she is keeping him from being a normal boy. But when Chief of police, Jake Sutton shows up with a puny apple tree on the anniversary of her husband's death, Jeremy instantly took to him and chose Jake in the new mentoring program at the church he attended. Emma's story was so heart-breaking. The author made it seem so real, I could almost picture her crying over the loss of her husband and her son's father. Jake was a sweetheart how he took Jeremy under his wing and really taught him a lot of guy stuff. He was sweet and caring, yet careful, with Emma's fragile heart. And in the end, it just happened...just like that! The healing didn't happen all at once, and I'm sure the healing for both continued a long time after this book ended. But it's always wonderful to see two strangers come together and become one!